(CNN) -- Ashton Kutcher has challenged CNN to a popularity contest on the social media site Twitter. CNN and Ashton Kutcher are racing for 1 million followers on Twitter. Video: King responds to Kutcher on "Larry King Live"
An information technology consultant in Croatia who is interested in the outcome of the contest has been tracking the rate of new followers for CNN and Kutcher. 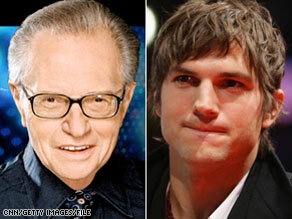 Marin Purgar says Kutcher will beat CNN to the 1 million follower mark before 4 p.m. ET on Thursday. Kutcher has been posting like mad to his account since challenging CNN to the battle. The celebrity -- known for the TV shows "Punk'd" and "That 70s Show," as well as for being married to actress Demi Moore -- has offered to give his millionth follower a copy of the video game "Guitar Hero."